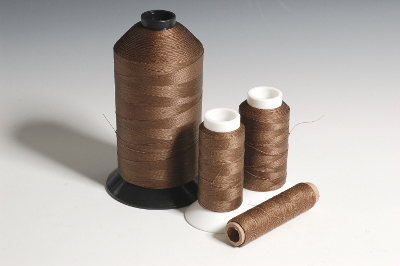 We sell Nylon, Polyester, Bobbins, Monofilament, Bag Closing, and Polypropylene thread. Use to sew strong, long lasting seams in fabric, leather, canvas, paper, and other materials. We sell to retail and business customers in sizes ranging from 2-ounce spools to 32-pound cases. 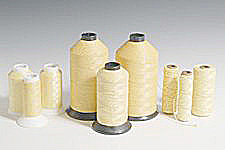 We sell Kevlar thread that can withstand temperatures up to 800F. 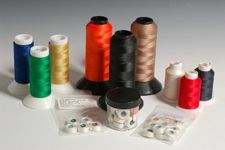 We also sell Fire Retardant Sewing thread, Fire Retardant Embroidery thread, fire retardant embroidery Bobbins, and filament Nomex that can withstand temperatures up to 700F. We also sell PTFE Coated Fiberglass thread that can withstand temperatures up to 1000F. We sell embroidery and home sewing thread including The Robison-Anton Store, that features the full line of Robison-Anton Polyester, Rayon, Metallic, Moonglow, Variegated, Twister Tweed, color cards at cost, and $10 King Spool Robison-Anton Polyester Overstock. We also sell Magna-Glide Bobbins, $3 Embroidery King Spools, $3 ARC Rayon King Spools, Embroidery and Sewing Thread Grab Bags, Valdani Cotton, Needles, and More. We sell crafts thread including Waxed Thread, Artificial / Imitation Sinew, Hand Stitching Thread, Polyester-Linen Thread, Bank Line, Leather Lacing, Hand Sewing Needle Kits, Beeswax Cubes, and Assorted Strings and Twines.